David E. James. Written Within and Without: A Study of Blake’s Milton. European University Papers, XIV, Anglo-Saxon Language and Literature, Vol. 54. Frankfurt am Main, Bern, and Las Vegas: Peter Lang, 1978. Sfr 37. David E. James sees Milton as a poem about poetry, about making it and reading it and achieving through it a transcendence of its own isolating conditions of reason and language. Poetry includes for Blake, according to James, political and psychological considerations (“Blake saw . . . that the rejection of imagination from the center of poetry was symptomatic of wide corruption in the body politic” [p. 12]; the Bard superimposes “specific historical reference over the more general psychological reference of the previous section” [p. 25]), but as the means of absorbing and ordering those considerations it is the paramount activity of the progressive human consciousness. Furthermore, Milton not only defines poetry, it continuously enacts the process of creation by which poetry comes to exist, not on a page but in the minds of author and reader: “the whole poem appears as a model of Blake’s mind. . . . Milton is not simply the record of Blake’s imaginative renewal, but the means whereby that renewal was effected” (p. 163); the poet forces “the reader to complete Milton by the effort of his own imagination, to recreate by himself the timeless moment of perception that is the center of the poem” (p. 5). This attitude toward Milton is hardly a new one, and the strategies by which Blake reveals his own imaginative process and commandeers the reader’s are familiar to all serious students of the poem. James does not really add to our knowledge of those strategies, but he does define them clearly, gracefully, and insistently, and in doing so he provides a service to anyone who needs company at the gates of Golgonooza. He describes the basic motion of the poem as “centripetal,” as a replacement of linear development by a spiraling around a single focus of action, the annihilation of what must be annihilated. All the participants in that action are for James “analyses” of the two main antagonists, Milton and Satan (see especially pp. 44-45), and he sees the author’s activity in the poem as a process of “separating what has been mixed,” of clarifying the alliances of those analytic figures so that what must be annihilated can be annihilated (pp. 128 ff.). James believes that the structure of Milton is mimetic of its conception of visionary reality, that the development of the poem is “not logical and sequential but repetitive and cumulative” (p. 132). His own work is to some extent mimetic of what it interprets, and consequently it approaches its argument “successively from a number of different points of view” (p. 6). These points of view range from an opening close reading of the Bard’s Song through various perspectives on the main action of the poem to accounts of the biographical contexts of Milton and their relation to Milton’s culminating speech. Because the poem ends, after all its spiraling perspectives on reality, in Blake’s Felpham garden, the only “real” place in the poem (p. 149), James ends his book with an account of William Blake in Felpham and of the visionary conversion which produced Milton and which is best defined in the poem by Milton’s last speech. To attempt to imitate in rational critical prose not only a poem, but a poem which is explicitly suprarational in substance and form, may seem reductive or quixotic, but it is also an ambitious act of sympathy. Sympathy seems to me the real virtue of Written Within and Without, which offers little new interpretation. The few hints it gives of special insight (e.g., the idea that Blake’s poetry should be approached “in terms of the begin page 53 | ↑ back to top conditions of the visual arts” [p. 110], the occasional suggestive analyses of syntax, the approach to Milton’s last speech through Hebrew versification [pp. 177-79]) are brief and subsidiary, and leave the reader wondering why the author settled for restatement of familiar approaches to the poem instead of pursuing the more original interpretation he is capable of. 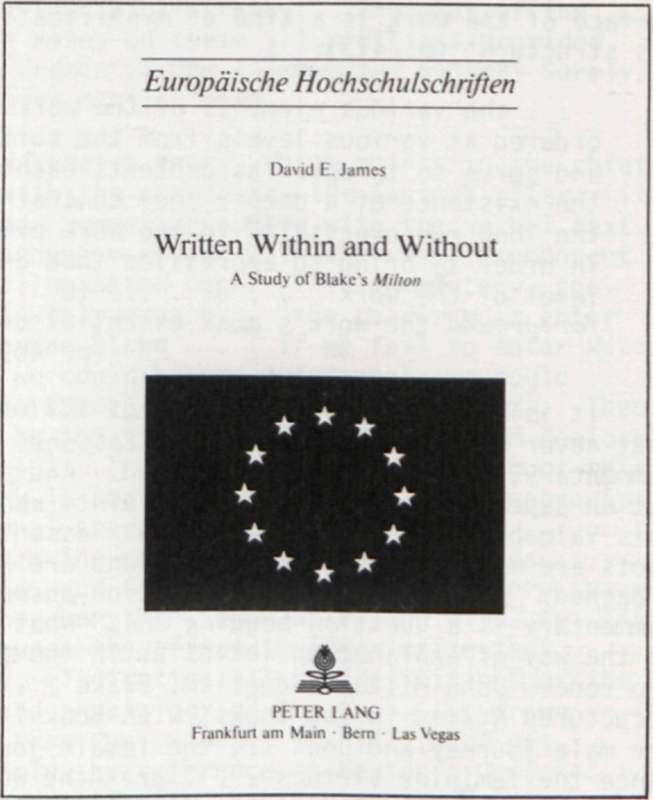 One answer may be the format of the book, which is a “European University Paper” and may be intended for a general academic audience not schooled in recent Blake criticism (and presumably not interested in such useful devices as an index, which the volume does not contain). For such an audience this may be a helpful introduction. For a readership more committed to Blake’s poetry, however, there are problems. For one thing, the book reads like a decent monograph padded out with obligatory dissertation demonstrations of context and close reading (do we really still need an account of John Milton’s reception in the eighteenth century, or a basic reading of The Marriage of Heaven and Hell? And a blow-by-blow commentary on the Bard’s Song is simply not justified at this stage of Blake criticism). James knows the perils of abstract definitions of Blake’s mythic constructs but, like all of us, is forced to make them and, despite his exceptional care to recognize the necessity of context to definition, his definitions are sometimes oversimplified: his presentation of the vortex (p. 80), for example, is perfunctory and, in its emphasis on the positive aspects of vortical consciousness, precariously one-sided; to call the sleeping humanity and the emanation of divided man positive and the spectre and shadow negative (pp. 75 ff.) is to propound a relative truth which is nonetheless a falsehood—no aspect of fallen humanity is simply positive, and the emanation in particular is frequently destructive in her own name, not just the shadow’s name. These and other local problems with James’s study might have been corrected in a different format. There is a major issue in his analysis which is not a subject of such correction, but which I must dispute in what I hope will be understood as mental strife. James does recognize the presence in Milton of political considerations, but he believes those considerations to be wholly subsumed by the visionary conversion the poem represents. Impatient with critics like Wittreich and Mitchell who assume a revolutionary activism in Milton (pp. 102, 186), he asserts that “By the time of Milton, Blake was firmly opposed to any revolutionary activity which would build the City of God on earth through force of arms” (p. 71). He warily cites Crabb Robinson against Palmer as evidence that Blake deplored Milton’s political commitment, and quotes the Reynolds annotations (“Empire follows Art & Not Vice Versa”) for corroboration. Though I do believe that Blake had moderated his earlier revolutionary confidence by the time he wrote Milton, and that he had withdrawn from conviction in an imminent political apocalypse, I do not believe that he repudiated political action. If the pressures of Napoleonic reaction and his own obscurity forced him to reconsider the source and nature of political activism, they did not evaporate him into some splendid idealist vacuum liberated from all material concerns. His attempt in Milton is not to liberate imagination from politics, but to inspire politics with imagination. James says that “Theory and practice in regeneration become identical, a polemical point central to Blake’s epistemology and one made possible only by the purely mental nature of all Milton’s activity” (p. 78, emphasis mine); I think that underestimates Blake’s epistemology. If Milton’s activity were purely mental, it would not need his incarnation in mortal Blake to be realized. Milton’s whole action is to redeem Ololon, an act of forgiveness which is “mental” because “mental” acts are what the immortals do; but Milton must descend to Blake to perform that act of redemption, and Blake is not immortal, and what Milton’s embodiment in him means to real Felpham and real London and real England remains to be seen. Theory and practice are identical in Blake, but not because practice is purely theoretical; in that case they would be not identical but redundant. Renovated theory renovates practice, just as inspired poetics creates an inspired poem. That poem is created anew each time one of us reads it imaginatively—but it is not created out of a vacuum: it is created out of the fifty plates of Blake’s Milton, a “self-consuming artifact” which manages to stay an artifact, a poem, a practice. James makes much of the replacement of Orc by Los in Blake’s poems, assuming that Los means an Ideal poetry as opposed to the Materialist politics of Orc. But Los does not simply substitute visionary poetics for revolutionary fire; Los, like Orc and like Rintrah, is a Reprobate prophet whose most dangerous act in Milton is to restrain his wrath and permit Satan to usurp Palamabron’s harrow. If all he has to be angry about is heroic couplets, that’s a waste of a lot of good wrath. True, his most positive act is also a restraint of wrath, that of Rintrah and Palamabron toward the descending Milton, and one might argue that this parallel means that Edenic, inspired wrath is positive whereas historical, political wrath is negative, that Imagination should be allied with Rintrah in matters of the immortal spirit and with Palamabron in matters of the historical flesh—but in both the Edenic milieu of the Bard’s Song and the Generational milieu of Golgonooza it is fatal to divide Rintrah and Palamabron: vision must be contrary to be whole; the stormy prophet who warns the Israelites of all nations is as necessary to the Last Harvest as the mild poet who heals them and sustains them. Both Rintrah and Palamabron are wrathful at the appearance of Milton’s shadow, and their wrath is Blake’s own wrath at oppression. That Milton can dispel that shadow through inspiration, that he can do so because Los’s mercy permits him to descend, means that whole, embracing vision is the source of the reversal. History is a corruption of eternity, and only those who understand that corruption can eradicate it. But that process of eradication is only begun at the end of Milton. Though James sees the conclusion of Book I as an apocalypse “foreshadowing” the final apocalypse at the end of Book II (p. 85; see also p. 121), in fact Judgment begin page 54 | ↑ back to top has only been prepared by the end of the poem; everything is ready for the harvest but the harvest has not begun. The passage James cites as evidence that the Judgment has occurred and Blake has transcended space and time to become “one with his art,” 42:24-27, is actually about Blake’s return to time and space to await Judgment. Throughout the poem vision and action are identified, but action—Milton’s descent to Blake, Los’s descent to Blake, Ololon’s descent to Milton-Los-Blake—is nonetheless real; vision cannot exist without it. At the end of the poem we have seen the vision of Edenic forgiveness which initiates the harvest. What process, what action realizes that harvest, what will happen in Felpham now that Albion is rising, what the Judgment of the twenty-four cities will be—these things are not spoken. Citing the change in the development of Blake’s ideas “from political activity to art alone as the means of regeneration” (p. 122), James merely begs the question of what art really is, of what it is concerned with and how it operates on human beings. It may be that Blake did not mean to suggest any political action resulting from the purified vision of Milton, that he believed, as many have supposed he did, that purified vision can be transmitted through poetry alone until all the lord’s people are prophets. James has not proved this, and he has not thought through certain compelling arguments in the poem which may not refute that supposition but at least challenge it. He argues, for example, that the vision of Bowlahoola and Allamanda at the end of Book I is Los’s vision of the Last Judgment, that is, that the Last Judgment is a product purely of the imaginative principle. But Bowlahoola and Allamanda surround Golgonooza in Generation; the vision of them by which Los calls his sons to the harvest is a vision not of eternity but of time and space, not of Judgment but of what is to be judged (see especially 27:49-63). Furthermore, Los has that vision only when he has been united with Milton in Blake; the vision is enabled by its embodiment in a mortal poet at the most desperate moment, the ultimate political crisis, of fallen history. James sees “the dangers of Orc-like energy and especially its political direction” as part of the satanic forces contending with Los (pp. 122-23), part of the analysis of Satan. But Orc, however much he participates in satanic activity, is not a form of Satan and will not be annihilated; he will be reintegrated into Albion. Milton, according to the prophecy Los remembers from Eden, returns to history not to vanquish Orc, but to set him free (20:59-61). Setting Orc free has never before Milton failed to mean political revolution. If it means something different here, Blake does not tell us so. James frequently asserts that in Milton Blake “turns his ‘back on these Heavens builded on cruelty’ (32:3), on the political vision of his youth” (p. 158), but he is also aware that Blake “felt and accepted a pressure of commitment to the outside world equalled only by Shelley of poets of the period,” that the “reference of Blake’s vision encompasses all humanity and in no sense can a charge against him of some kind of mystic solipsism be warranted” (pp. 168-69). James’s explanation for this paradox of both turning away from this world and accepting a commitment to it is that Blake interpreted that commitment in a new way, not as political activism but as poetic purification. If that is true, it argues not “mystic solipsism” but political confusion, in Blake and in critics who do not challenge such principles. Obviously you need to know what is wrong with the world in order to change what is wrong: the False Tongue, like all manifestations of false consciousness, must be known to be defeated. But just knowing what’s wrong won’t change it. The Socratic idea that knowing the just and true way to proceed ensures proceeding justly and truly—even if we grant “knowing” to be a vast and comprehensive state—has been refuted throughout history. Our enemies do not vanish because all of us learn the same regenerating truth, first because there is no way, not even by the finest poetry, for us all to learn that truth in time for peaceful conversion, and ultimately because there is no such central truth, unless it is something as vaporous as that we must live in peace or die in war, that we are all the same flesh and the same spirit, or that some greater power . . . divinity, ecology, or singing spaceships . . . wants us to be good. If all human beings could be purged in imagination we might make a start—not only is that a comic if, but even if, it would only be a start. That Blake saw the start of regeneration in purified consciousness is unexceptionable. If he saw only purified consciousness as full human salvation, he was naive. Such naivete would be understandable in a bitterly obscure radical poet enduring Napoleonic reaction. But it can not be allowed to be passed, either by Blake or by his critics (or by his contemporaries, however august their philosophical system), for wisdom. The debate on Blake’s politics is not new, and James neither proves the anti-political reading of Milton nor criticizes it. The issue is not central to his analysis, though it is important insofar as it justifies his focus on the poem as a study of “poetry.” His treatment of it is characteristic of his treatment of all the provocative issues in Written Within and Without: interesting, well-worded, sincere, but undeveloped.